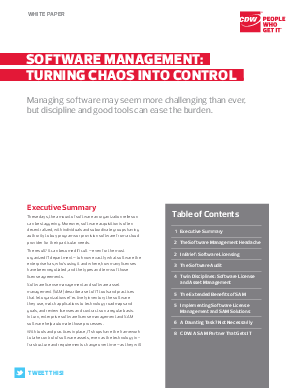 These days, the amount of software an organization relies oncan be staggering. Moreover, software acquisition is often decentralized, with individuals and subordinate groups having authority to buy programs or provision software from a cloud provider for their particular needs. The result? It can become difficult — even for the most organized IT department — to know exactly what software the enterprise has, who’s using it and where, how many licenses have been negotiated, and the types and terms of those license agreements.